Pragmatic Mom’s son went through a serious dinosaur phase that lasted almost a year when he was 4-years-old. Now he’s into pokemon….sigh! I prefer reading about dinosaurs! Here are our favorite books, both story books and non-fiction books. As always, click on the image of the book to purchase on Amazon.com. Insiders: Dinosaurs by John Long. A great reference book that is fun to read with really good and realistic illustrations. [ages 3-10]. Night at the Museum by Milan Trenc. A fun story book to inspire the family to visit a museum of science! [ages 3-7]. How Do Dinosaurs…Series by Jane Yolen. 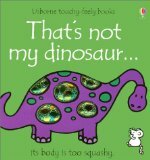 My son loves them all, especially reading the dinosaur names on the front and back inside covers. [ages 2-7].